Home » Caribbean Youth #Hackzika! Ministry Of Health partners with local innovators to aid in fight against Zika; Several Promising Web and mobile applications created. With a call for varied sections of society to join the fight against the Zika Virus and other vector borne diseases, and just a day after Jamaica launched its open data portal, local Civic Tech Organization, Slashroots Foundation in collaboration with the Caribbean Open Institute, Mona School of Business Management, the Ministry of Health and other international partners hosted the successful Zika Hackathon this past weekend (June 25-26) in Kingston, Jamaica. The event which follows the recent Developing the Caribbean Conference and Code sprint (DevCa 2016) in May encouraged teams of Engineers, Designers, Entrepreneurs and other problem solvers across the Caribbean region to interact with data and find meaningful solutions to protect communities against the Zika Virus-to #HackZika. With close to 30 tech enthusiasts in seven teams, a diverse audience and other persons from across the region joining the social media conversations, teams utilized open data provided by the Ministry of Health through the newly launch Government of Jamaica Open Data Portal and the geospatial data from Mona GeoInformatics Institute to build web and mobile solutions to assist the public in combating the spread of the Zika Virus. After a challenging 24 hours and enthusiastic presentations, the Trafalgar Travel sponsored three member team of Christopher Derrell, Lewainne Vidal and Jonathan Cooper, competing as team Solve, emerged the winners of the DevCa Zika resilience challenge. Their application, an interactive voice and text enabled solution; DocBot asks users several screening questions, offer a diagnosis and shares recommended actions for treatment and recovery from the Zika Virus all from the comforts of your home. In second place was the Zika Warriors comprised of Agyei Masters, Carlton Gordon and Dean Morris and sponsored by RealDecoy. They created and gave a demo of a web and mobile based application which collects data around incidences of Zika Islandwide which can then be easily accessed by the Ministry of Health. Team A Town Mappers, including Errol Jackson, Nickalos Robinson, Theodore Campbell, Daniel Wilson; and Brandon Hinds, sponsored by Pitch It scored the third place spot. Their #HackZika solution combined offline “community mapping” with an app to motivate citizen action to identify and eliminate waste and other mosquito breeding sites in their own communities. While the teams were motivated by the over US$2000 prize pool, several competitors noted they participated in an effort to do good for their communities. One such competitor Christopher Derrell of first place team Solve noted that he was motivated to enter the challenge because it hit close to home when his girlfriend contracted the virus and brought him closer to the realization that everyone can be affected by the Zika Virus. Key stakeholders at the event all had high praises for the organizers and the participants who created such promising applications. Dr. Karen Webster-Kerr, National Epidemiologist; Dr. Michele Roofe, Senior Medical Officer- Health Informatics in the Ministry Of Health; Mather Pfeiffenberger, Operations Analyst, Transport & ICT, World Bank and Dr. Ava Maxam Deputy Director the Mona GeoInformatics Institute and all lauded this step and noted they looked forward to the advancement of the designs. In addition to the cash prizes, winners in the hackathon will be able to access coworking space with Start Up Jamaica and gain support from the Ministry of Health to advance the development of their applications. The DevCa resilience challenge was also supported by the International Development Research Centre (IDRC); Open Data Charter; Cable and Wireless Business, Trafalgar Travel, RealDecoy, Connectimass and PitchIt. 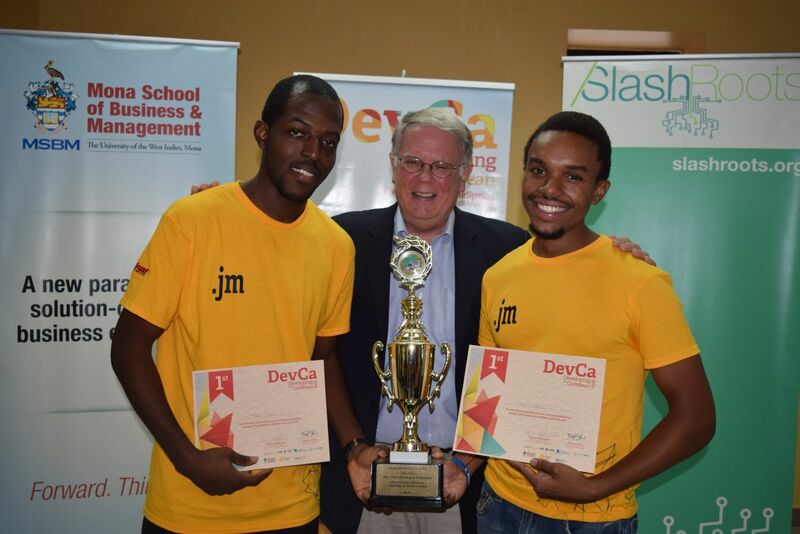 DevCa 2016 #HackZika winners Lewainne Vidal, Christopher Derrell and Jonathan Cooper (missing from photo) of Team Solve share a winning moment with the World Bank’s Mather Pfeiffenberger.